This is how your daily bread is made. Some of the steps might be separated by months, but in essence all yeast breads are made this way. Today was bread day. I have been stuck in a rut making the extremely easy and tasty no-knead loaf, but this time I wanted more of a sandwich loaf so I tore myself away from being lazy and made the just slightly more involved sandwich loaf. For this loaf I start from the wheat berry, grind my own (obviously whole grain) flour and then begin making the bread. The resulting loaf will NOT be the dark wheat loaf you know from the supermarket and will NOT have that heavy strong wheat taste, but it will have a wonderful taste of the whole wheat. 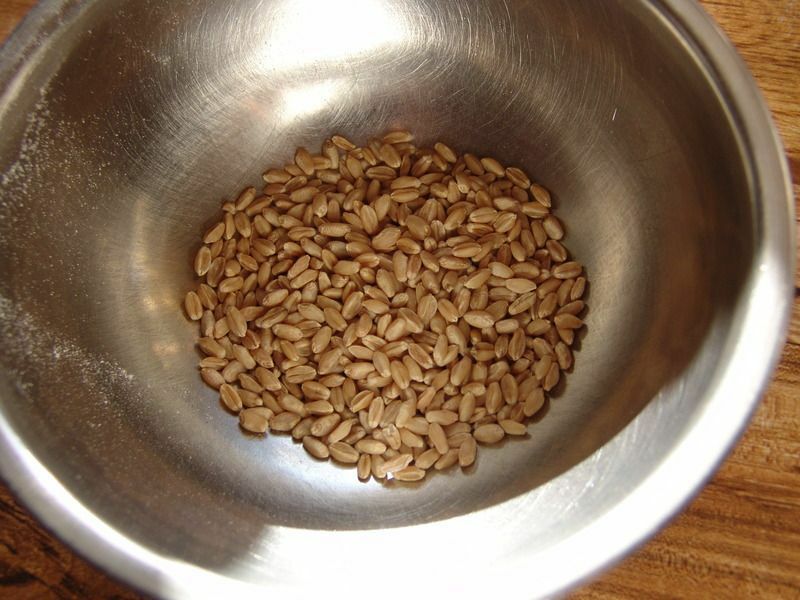 To do this I use white wheat and not red wheat. 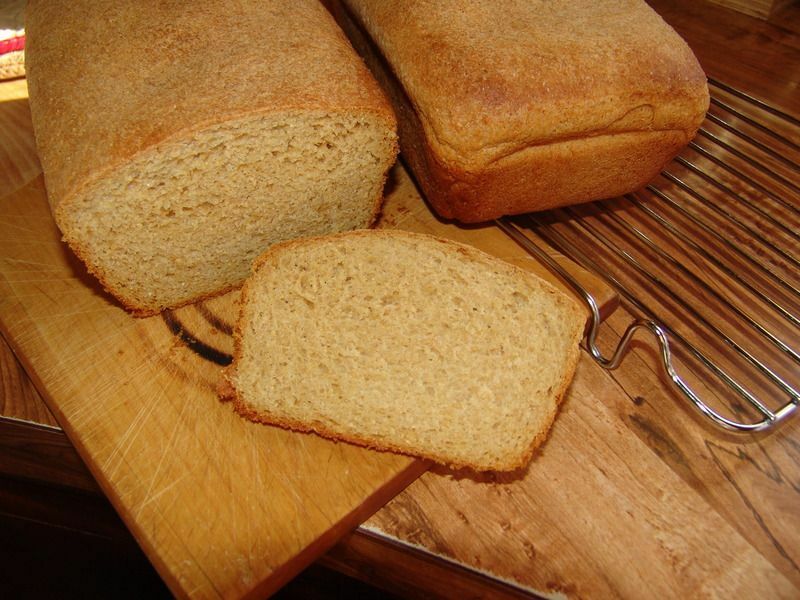 You are probably most familiar with whole wheat bread made from red wheat. That is, unless you grind your own wheat. which is ground into flour. I grind it 3 times on the finest grind. I do this not for the sake of the flour, but to get the bran as fine as possible. Bran is death to gluten structure and gluten structure is required for a good yeast bread. At one time I would grind my flour only once and I had failure after failure with the loaf rising, then mysteriously falling. I traced the problem to the large pieces fof bran which act like knives to destroy the gluten structure. The tiny bubbles of trapped CO2 would get to a certain size, then the bran would destroy the bubbles. Grinding 3 times stops that. But there are other problems with bran. Bran also contains chemicals that destroys gluten structure, or inhibits it. To counteract those chemicals, since I can’t separate them out, I add ascorbic acid (vitamin C) to strengthen the gluten. I also add lecithin as a shelf life enhancer and as an emulsifier for the butter. Both of those additions are very good for the body. Diastatic malt is also added to help convert wheat starch into sugar for the yeast. I make that myself and it’s made of sprouted wheat. The result from my recipe are 2 loaves. 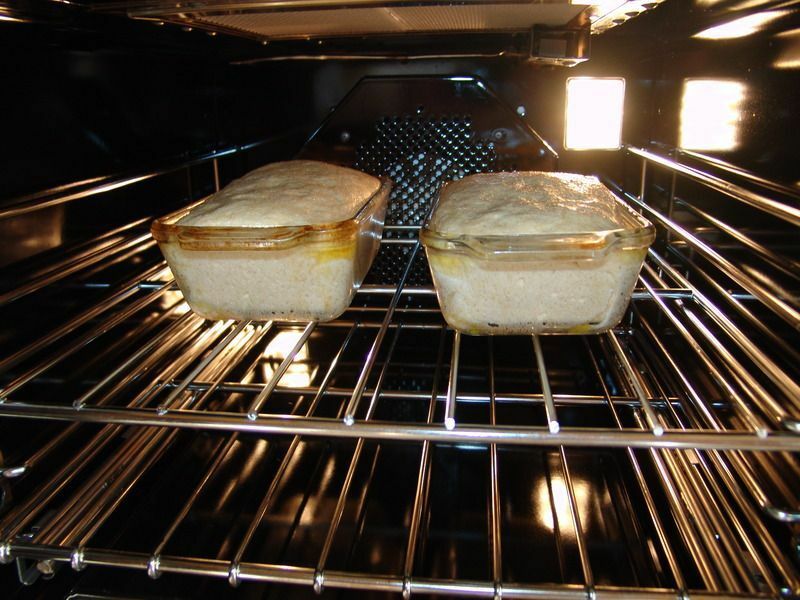 Here seen in a just warm oven to allow the yeast to grow and “fart” into the bread making those tiny bubbles we need to get the bread to rise. 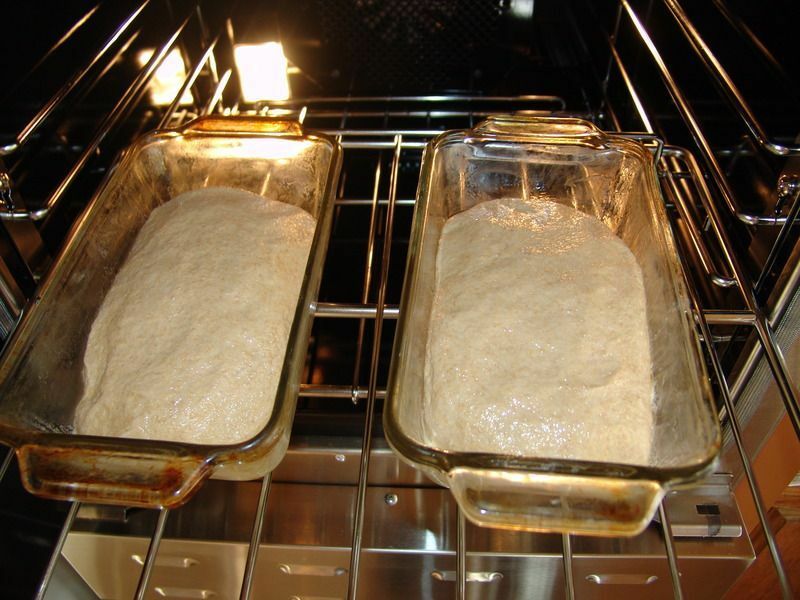 Here the loaves are seen after rising for approx’ ½ hour. I didn’t and don’t time it. I go by the way it looks as there are so many variables that can change the time required to rise. Here the oven is up to temp’ and I’m about to close the door to allow them to bake. It's been awhile since I made this bread and I should have waited 5-10 minutes more to get a bit more rise. But they'll do. The finished product. The loaves are actually a bit lighter in color than this picture shows, but I’m not going to doctor the image to reflect reality. The flavor is one of real whole wheat bread that contains all of what the wheat contained. The whole wheat flour bought in the store doesn’t contain everything. If it did it would go rancid in a short time without refrigeration. That’s why I grind my wheat minutes before I use it. 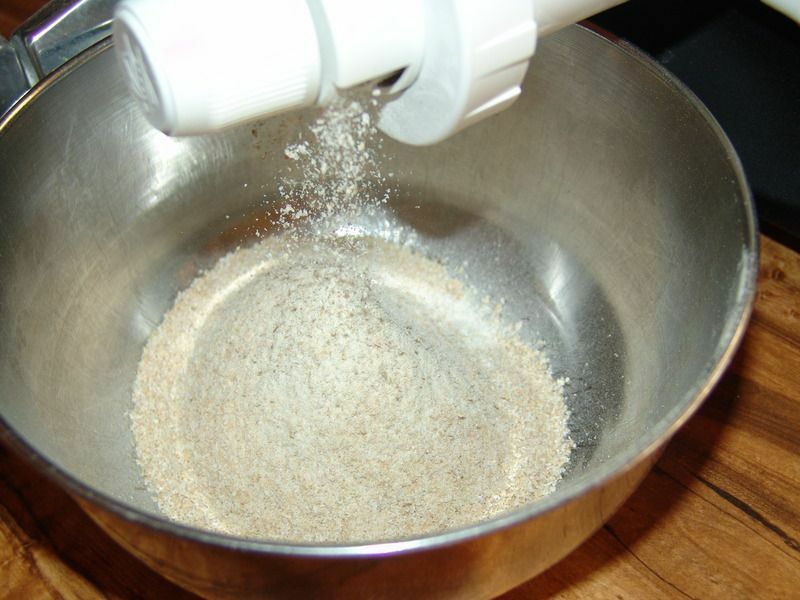 Store flour only puts back into the mix those items which won’t spoil. The stuff that spoils is where lots of the really good stuff is found. As is the rule in our home, the baker, that’d be me, get’s the best part of the loaf. That’s the end while it’s still warm and crunchy. There is nothing better on the planet than the smell of bread baking and a slice of freshly baked bread with butter. If someone grinds their own wheat and wants the recipe, contact me. 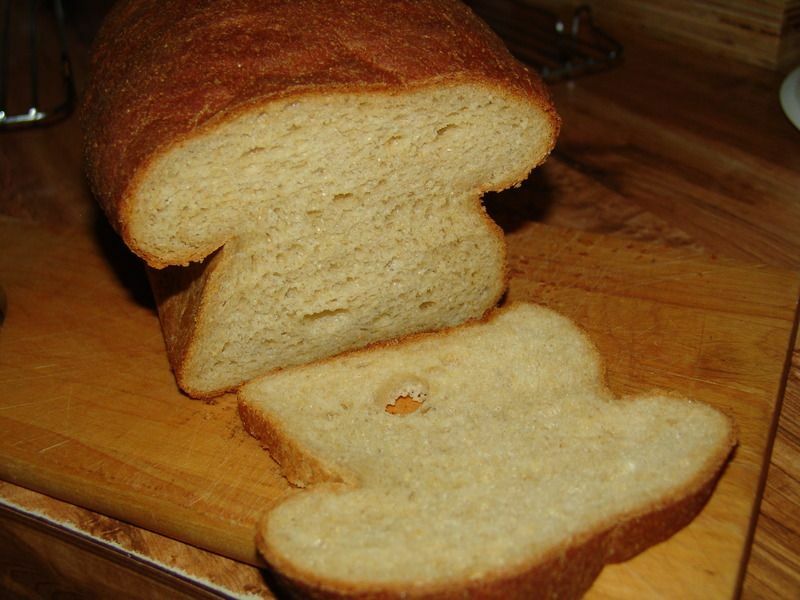 If you use store bought whole wheat the recipe will need to be changed to use what you buy. The original recipe is found on the King Arthur Flour site and is called Classic White Sandwich Bread and uses off the shelf all purpose white flour. After making these loaves I realized that I can lighten my work load and have fresh bread more often by doubling the recipe to make 4 loaves worth of dough, and freeze half of it. 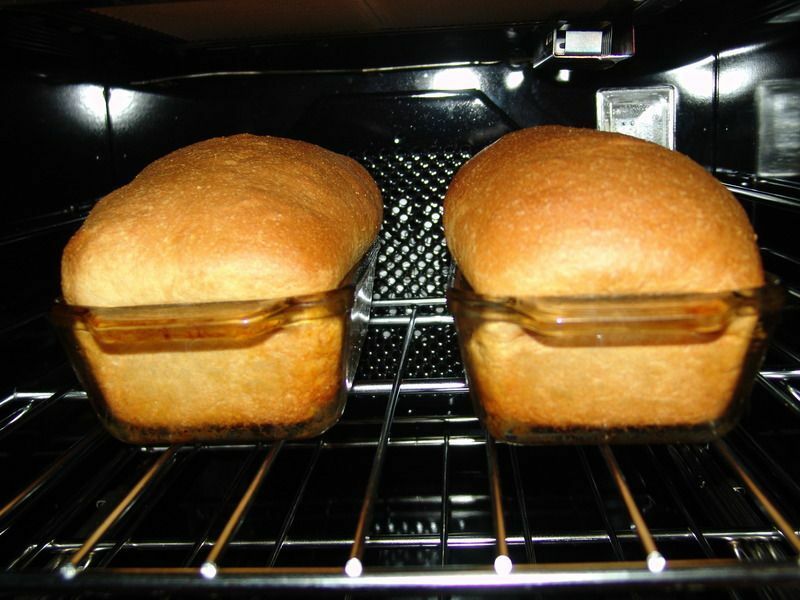 Next time we want bread I just thaw the dough and put it into loaf pans. FWIW, the second loaf made today will be frozen for next week. Tip: when making ones own bread, no matter what type, NEVER store it in plastic. Plastic is OK for freezing it however. Instead cut what you need and store the rest of the loaf on an impermeable surface, cut side down. That stops the cut side from drying out and the outer crust inhibits the drying out of the loaf, and since it's not in plastic full flavor is retained. I don't know that anyone knows why, but plastic storage destroys the flavor of bread in a day. Too, plastic creates a perfect "greenhouse" for mold growth. One thing one must get ones head around when making bread is that the loaf begins to stale after it's cooled and it has a finite shelf life. It can somewhat lengthened, but the best use for bread changes from day to day. If the loaf lasts long enough eventually it's best use is croutons, bead crumbs, bread pudding, or dunking into hot soup. There's no reason to ever throw bread away. Very informative - thanks. What grinder do you use? Do you have a good source for the grain? Nice bread and nice oven Brian. I use a Country Living grain mill, hand powered, but you are able to put a belt on it if you wanted an electrical device to run it. Here http://rainydayfoods.com/hard-white-wheat-6gal-rb.html. It comes in a sealed Mylar bag inside of a 6gal super pail. A few years ago my neighbour and I got together and ordered a pallet from them. Hard white wheat, hard red wheat, whole oat groats, garbanzo beans, lentils and brown rice. We like the the oat groats especially, better than your regular oatmeal. Chewier, a little longer to cook, but better,nuttier flavor. Closest would be steel cut oats. (12-27-2015, 05:30 PM)Cincinnatus Wrote: Very informative - thanks. What grinder do you use? Do you have a good source for the grain? I get my grain from the local healthy food type store. I buy it by the sack to get their best price. But there are many types of grain. It's worth doing your research to know what you should buy. I educated myself with the book Flour Power. My everyday grain mill goes onto my Ankarsrum mixer*. It's the Family Grain Mill. But there's a trick to buying it... If one gets the hand crank version you have the option of hand cranking it, or with an adapter it can be used under power. I believe there is an adapter for KitchenAid, but research it. I read many stories of burnt up KA mixers from grinding flour. KA uses a universal motor and they don't tolerate loads or heat well at all. Grinding is a lot of work; and that means load on the motor and heat. When I grind grain it's grinding while I get the other ingredients weighed out and such in the mixing bowl, so it really takes no time to do it. The Family Grain Mill won't grind everything though. I haven't had to do it yet, but things like garbanzos and beans I would put through the blender to make them finer for grinding or just finish the grinding in the blender. When it's set up, which isn't frequently, I have a Diamant that I also use. It has the option of hand cranking, but the pulley on the crank has a groove for a v-belt. After hand cranking that mill for even a short time I was sold on the electric drive option. So I got a low rpm motor and the tiniest pulley I could put on it and use it under power now. But I only set it up when I have a great deal of grinding to do. It will produce flour as high quality as the Family Grain Mill. But the thing weighs 80# or some such; more now with the motor drive, so it only gets set up rarely. The thing is a beast, but it will make short work of 50# sacks of grain and anything can be put through it. When I write "anything" I mean grain and such. It makes very fine corn, bean, and garbanzo flour. I've never ground anything oily in it (like peanuts) because I don't want the clean up so I have no idea how it works with items like that. I have tried to grind peanuts in the Family Grain Mill with the goal being peanut butter, but that doesn't work without adding things to the mix and I don't want oat peanut butter (for instance). But when I want to make my own peanut butter I use the shredder on the end of the meat grinder for 1/2 of the peanuts. The other half goes into the Ank' blender, which is really a hammermill grinder. One makes very fine peanut shreds, but since peanuts are quite brittle it's more like a dry paste. The blender makes a very fluid peanut butter. Mixing the 2 makes it just right. Just a short note on Ankarsrum attachments. The Ankarsrum is called the Assistent (not misspelled) for a good reason. In dribs and drabs I got many of the attachments and I have never regretted the purchases. They are all high quality and do what they are supposed to do in great shape. I've had it now for 2 or 3 years and in that time I have never used the Cuisinart food processor even once. When Ankarsrum calls it the Assistent they name it well. That's the way I think of it. I buy groats also Charlie, no more pre flaked. Who knows how long they've been flaked and hanging "around'? The ank' has a flaker that turns groats into quick cooking oats and it doesn't take long at all. My brother does it by hand with the family Grain Mill flaker and he makes his fresh every day. Yes fresh is much better. Have you tried opening up your mill to just cut the groats? That would give you steel cut oats. You might want to sift out the fines, but I wouldn't. They'd make the cereal creamier I would think. I do use some commercial flour; not all of what I use is home ground, and unless it's cake flour I buy King Arthur. It has consistently very high quality. There are times that I simply don't have time to grind flour for one reason or another, or don't want the full taste of the real stuff. *I'm fairly frugal. Frugal does NOT mean cheap or skinflint. It just means that when $ is spent it must give a return. Basically don't throw money away. Make it work. When it was clear that the KA mixer wasn't going to work for us, I went on a search for a better unit. Better also meaning one that was more suited to the job of mixing. A lady from Nova Scotia told me about the Ankarsrum and here experience burning up 2 KA mixers (I only destroyed one). Then I went onto shaving forums inquiring as to the unit. "Marius" got back to me and told me about his moms Akarsrum and how it has been working for decades with no repairs. How the "meat grinder", Ankarsrum just calls it a grinder since it will grind anything, has ground up countless caribou to feed their family, and how the rest of his family all has Ankarsrums. I bought one and have never regretted it. It wasn't inexpensive, but neither are mixers that require constant repair and never work right in the first place. The grinder is capable of grinding over 300 pounds of meat an hour. The limiting factor is having enough help to bring the meat over and take the ground meat away. The grain mill will operate continuously for hour after hour and never overheat or crap out. It's simply built to work. It does require a different way to think about mixing and such as compared to a mixer with a motor over the bowl. Americas Test Kitchen can't get it through their skulls that it needs to be used differently and if they even test Ankarsrum always give it failing marks when it's a far superior machine. I can and have made loads of bread that the KA absolutely can't handle. The Ank' never breaks a sweat and just chugs on drawing under 200 watts (it's a 600 ? maybe 800? watt motor). It fully kneads breads and I do nothing but form the loaves. It does so consistently without me even checking on it and it'll shut off when it's done. It makes bread making incredibly easy otherwise I wouldn't have time to do it. But if we want dinner rolls making them is a snap and we can have fresh homemade rolls in 2 hours with very little actual work on my part. Or the bread I made? Another under 2 hour bread. It'll taste better if it takes longer, but I had that bread baked in well under 2 hours. I was not tied down for that 2 hours I was doing other things. Of course one could watch the bread rise and such if one has a mind to do that (and waste the 2 hours). Yeah, I like the Ankarsrum. I'd buy another in a heart beat if anything ever happens to this one, but I doubt anything will. It's made to last for a lifetime. I've heard of only one problem with it and I dug deep looking for problems when I was researching it. My brother tried to grind something (grain mill) that shouldn't have been ground and he broke the plastic drive shaft on his grain mill. BTW, he went through 3 KAs then bought an Ank' on my recommendation. He has since bought one for each of his sons. Thanks for the information and sorry for the delayed response - been a very tough week. I have been researching grinders but better to get feedback from someone with experience then just a random write-up on the company site. A lot to digest here and again thanks for taking the time to put the information on the site. I know of folks who have other mills and I used their experiences and stories to guide my choice. If I can be of help PM me. There is no perfect mill, they all have their good points and bad points. All we can do is choose what we need from the best qualities and try to minimize what will be problems for us. If you intend to grind I strongly suggest the Flour Power book. I'm not suggesting that you buy it from the link, I only supply it to show it to you. I was going to make dinner rolls tonight, but we needed bread and I really like some freshly ground wheat in my bread so I compromised. Instead of dinner rolls which use factory flour, I opted for 2 loaves of 50/50 factory flour/fresh flour sandwich loaves. Not dinner rolls, but eaten fresh out of the oven, they'll do to satisfy. The wife and I were discussing what scents are better than yeast bread baking. I couldn't come up with any off the cuff. She came up with roasting turkey. I don't know if it's better (maybe); the scent of a low and slow BBQ of either pork or beef is it's equal. Just scent heaven (but quite different) ! I'm eating a late dinner to wait for the loaves to cool down for slicing. You have no idea how difficult waiting is. I'm hungry and the scent is to kill for. BTW, the loaves were a variation of King Arthur Flour's Basic Sandwich Loaf. I used 50% hard white winter wheat and 50% KAF bread flour. Some other changes to the recipe to accommodate the real whole wheat (USDA whole wheat is not whole wheat). I'm not jaded enough to not click my heels when I see a great oven spring from the loaves. The loaf gave a really great oven spring. Brian, I can almost taste it from 3,000 miles away. Not only that, the slices are in the shape of one of my favorite foods, mushrooms! Mine too! I don't know why the loaves collapse inwards like that. But if the top of the loaf gets that high above the pan it always happens.